It seemed like a star-crossed moment out of a comic book, an old issue of the Marvel series “What If,” perhaps: Backstage at Bridgestone Arena in Nashville, a photo was taken of country-gospel titans the Oak Ridge Boys and alt-rock gods The Flaming Lips. The picture was shared by the official Oak Ridge Boys Twitter account, and fans marveled at the combination. “Ladies and Gentlemen … the Oak Ridge Lips!” wrote one person. “From two worlds they came!” exclaimed another. “She Don’t Use JElvira,” referencing the Lips track “She Don’t Use Jelly” and the Oaks’ hit “Elvira,” chimed in a third. It was a pop culture snapshot both charming and bizarre, and for Oaks bass singer Richard Sterban, it was just one more incredible moment in a night full of them. “Quite honestly, I’d never heard of The Flaming Lips until I met them that afternoon during rehearsal,” Sterban told The Daily Times recently, recounting the star-studded affair that saw the Oaks, the Lips and numerous other celebrities and musicians gather together for a farewell concert to mark the retirement of country music star Kenny Rogers. Their friendship with Rogers is a long one, dating back four decades; Sterban credits Rogers with helping the Oak Ridge Boys achieve superstardom during the 1970s, and for providing a template for the holiday concert the Oaks will bring to The Tennessee Theatre in downtown Knoxville next week. It would be easy, of course, for the guys to skate by without much rehearsal, given how long they’ve been combining those golden voices together as one. The Oak Ridge Boys — Sterban, Duane Allen, bushy-bearded William Lee Golden and Joe Bonsall — are the continuation of a tradition that began back in 1943 with a group known as Wally Fowler and the Georgia Clodhoppers. That Knoxville-based group performed so often in Oak Ridge, according to band lore, that the name of the group was changed to the Oak Ridge Quartet. A burgeoning gospel career followed for the next couple of decades, with the “Quartet” being dropped in favor of “Boys” in 1961, and in 1964, Golden was the first of the current lineup to join the band. Allen followed, and by 1973, Bonsall and Sterban were on board. They guys received encouragement from Johnny Cash and Jimmy Dean, and in 1976 cut their first country album, “Y’all Come Back Saloon,” touring with Roy Clark and winning the Best Vocal Group Award from the Academy of Country Music the next year. Through the end of the decade, the band branched out worldwide, but it was “Elvira” in 1981 that turned them into country superstars. One of the most memorable recent performances, he added, was in 2016, when country star Blake Shelton asked the guys to guest on the track “Doing It to Country Songs,” off of Shelton’s 2016 record, “If I’m Honest.” They readily agreed, and during the CMT Music Awards broadcast that year, he asked the Oaks to perform it live with him. In addition to sales success and massive radio popularity, the song also netted the Oaks a truckload of awards — the Country Music Association Single of the Year, the Grammy for Best Vocal Performance by a Country Group or Duo and the Single of the Year by the Academy of Country Music. It certainly wasn’t the last time the Oak Ridge Boys dominated the country charts, however. Between 1980 and 1989, the group charted 15 No. 1 country singles (“Trying to Love Two Women,” “Bobbie Sue,” “American Made” and “Gonna Take a Lot of River” among them) and 10 more that made it into the top 10. From 1987 to 1996, the Oaks soldiered on without Golden, but it wasn’t the same band without him — agreed both the Oaks and their fans — and upon his return, the group has continued to pile on the awards and churn out the albums. In recent years, they’ve cleaned up on the nostalgia circuit — performing the hits with which fans are as familiar as an old favorite shirt — but they haven’t been content to settle for being an oldies act. Two years ago, the Oaks recorded a cover of “Seven Nation Army,” the fierce rocker by the White Stripes, and they’ve recently worked with white-hot producer Dave Cobb on a new record due out in March, Sterban said. For Sterban, who grew up in Fairview, N.J., Christmas always takes him back to his childhood, when the town held a contest for the best decorated house, and families throughout the hamlet put forth their best efforts to decorate for the holiday season. Sterban remembers riding through town with his parents, his brother and his sister, staring in wonder at lights through the backseat glass of the family’s car; later on, as a student at Trenton State College, he remembers going from dormitory to dormitory with a small caroling group, singing sacred Christmas songs that continue to mean a great deal to each of the Oak Ridge Boys, he said. 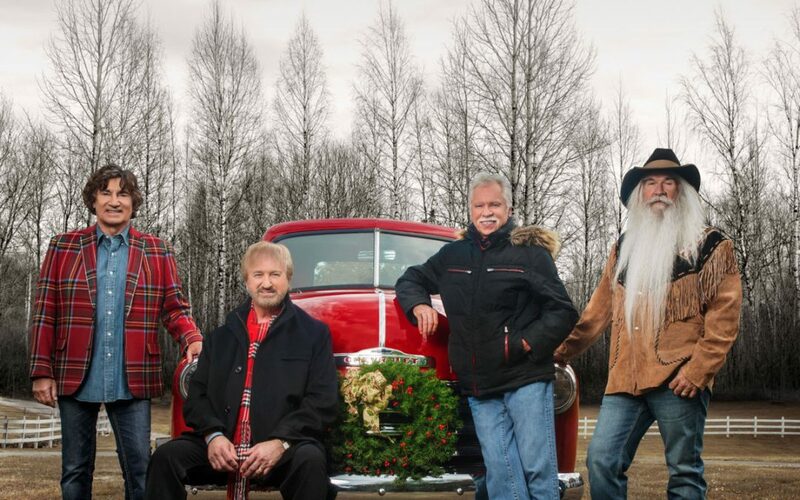 And even though a lot of years have passed between then and now, that love of music — of sharing it, of singing it, of watching it bring smiles to the faces of fans who have been along for the ride for decades all the way down to children barely old enough to walk — is what keeps the Oak Ridge Boys going.